Mikaël Zayat | ZAYAT AROMA INC.
Born in Egypt, Mikaël Zayat, Alchimist in Essence, has spent over 30 years mastering the art of distilling aromatic plants to extract their essences (essential oils). 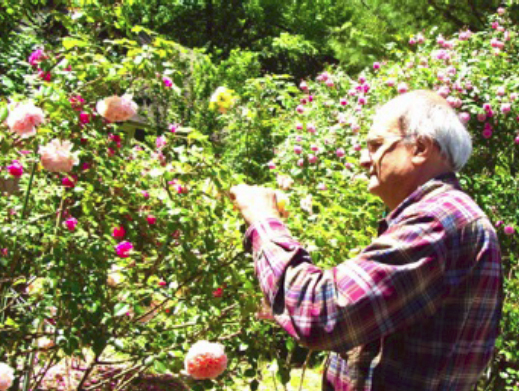 He is a world renowned pioneer in holistic aromatherapy and in the distillation of plants native to Quebec. His aromatic creations and synergies are appreciated all over the world for their numerous qualities. Eloï A. Zayat, his eldest son, incorporated the company on Septembre 21, 2011, the International Day of Peace. They unite to offer the best from the noble tradition of 100% natural essential oils. For thousand of years, the essences and extracts of aromatic plants, commonly referred to as essential oils, have held an important role in the healing of the body, mind and spirit. Less than 10% of the world’s vegetation contain aromatic molecules and even fewer are can be extracted into essential oils. These precious liquids are the very essence of the plant, some say the spirit, defining it, protecting it, and giving each its own unique character. Prized and valued, these plants and essences have been used for centuries in rituals, ceremonies and to purify sacred places. We can also assume that the term “perfume” comes from the french “par fumé”, literally “by smoke” referring to the traditional burning of these aromatic plants to purify, deodorize, and “perfume” places and the people who use them. Distinguished descendant of oil-producing ancestors, Mikaël Zayat now transforms the unctuous liquid into perfume. Calming, energising, or inspiring decoctions…everything to breathe in health. Behind his home, at the foot of Bromont’s mountain, Mikaël Zayat bathes in milky light. Bent over his artisan’s still—his crucible—he distils branches or flowers (spruce, goldenrod, fir…) extracting a fragrant, toning, or relaxing essential oil. With childlike manners and slow movements, it seems as though, for him, time escapes worldly constraints. He adores hemlock spruce, a conifer whose foliage, is as gentle to the touch as “a mother’s love,” its essence helps people to overcome the difficult stages in life. He readily collects it along the forest’s edge, just like St-John’s wort with its brilliant yellow flowers and antidepressant virtues. In his basement, its white walls bedecked with books, test-tubes, and hundreds of brown bottles, he concocts mysterious potions for use in calming nerves and softening skin. We are in his “wine cellar.” Name an essence and chances are he has it in stock thanks to a network of European and North-African artisan friends who mail him rose water, paperbark tree oil, or shea butter. His family name comes from an Arabic word which means “oil manufacturer.” Over the 4000 years of Damascus’ existence, Zayats pressed olives. Emigrated to Egypt a century ago, they scattered toward other occupations. But it was in Quebec, after Mikaël arrived in 1970 to complete a thesis in education, that he discovered, with great wonder, the many branches of traditional medicine. And he fell in love with the country. He does not make a mystery out of his spiritual roots. His serenity is inspired by St Francis of Assisi and by his prayer, “Lord, make me an instrument of your peace. Mikaël Zayat, Alchemist in essence, is a producer of essences and the creator of numerous aromatic synergies. He is a pioneer of aromatherapy in North America, and he is an internationally renowned expert in the field of holistic aromatherapy, fostering the balance between body, mind and soul. "Education starts in the womb and ends in the tomb, at least!" "Never Under-stand : Stand up and walk proudly toward your Divine Destination." In the late 1960s, Mikael was the private secretary of renowned poet, philosopher and writer Dr. Taha Hussein, who was Egypt's minister of education and head of the Arabic language institute. Together, they travelled in North Africa and Europe. Published in the Records Newspaper, Septembre 2010. Bromont — A school need not be multi-storey brick building crammed with computers. Indeed, in this case the school is a modest suburban bungalow, hardly different from its neighbours save for the few cars parked in front of the house and a back yard that features a tepee and a small labyrinth. This is the home of Mikaël Zayat and his family. When I finally meet him, both the man and his work prove to be a surprise. What I had first heard of Mikaël Zayat was that he produced and sold essential oils. Eventually I will learn that he is the founding president of the Alliance of Quebec Essential Oil Producers. There are some 20 small firms around the province which produce and sell essential oils. For his part, Mikaël distils or extracts essences from some two dozen different trees, shrubs and plants which are commonly found in the fields and forests around Townships. As well he imports hundreds of essences from around the world. Appropriately enough, his last name, Zayat, comes from an Arab word which means maker of oil. If the word teacher evokes the image of a somewhat harried individual standing in front of a large group of children or adolescents crammed into a classroom too small for the actual number present, Mikaël Zayat will tell you that he’s been there and done that. Born in Egypt almost 65 years ago, Mikaël Zayat trained to be a classroom teacher. After hitchhiking around many of the countries that border the Mediterranean Sea, he came to Canada and enrolled at the University of Ottawa with the intention of pursuing a PhD in Education. His particular interest was comparative education and he worked closely with his thesis director, Dr. Athanas Ramunas, to the point of translating into English a book entitled Comparative Education in the Teaching Profession written by Dr. Paplauskas Ramunas. However, a couple of factors, including the premature death of Dr. Ramuas, led Mikaël Zayat to eventually abandon his thesis and his doctorate. By the early 1980s, by which time he had gained experience teaching at several different levels from Grade One to University courses and that included one class of 40 youngsters deemed to be juvenile delinquents, Mikaël Zayat decided to move on from institutional education. Over a relatively short period of time a couple of significant things occurred in his life. One was that on a train ride to Trois-Rivières he met Katherine Courchesne, the woman he eventually married and with whom he has raised two children into adulthood. The other is that he fell seriously ill and was cured not by surgical intervention but by herbs and diet. Mikaël Zayat works from home and the entire basement floor is given over to his teaching. The largest of the rooms, the one you enter as you come down a flight of stairs, evokes an impression of abundance. The room is full, almost to overflowing. Three of the walls are covered with floor-to-ceiling bookshelves—a library of some 2000 books, Mikaël estimates. In the one corner devoid of books there are smaller shelves holding, among other things, some 400 small bottles of essences. The floor space is largely taken by an oversized table piled high with books and papers. There’s a small reading corner with a very attractive and unusual wood chair, while in another corner you’ll see a brightly painted, old-fashioned pupil’s desk and unusual toys for balance and co-ordination. Another room, much smaller, is equally packed with musical instruments, of which only a couple of flutes and a guitar are easily recognizable. The room is dominated by a relatively large, short-legged, lustrously-finished, hardwood table. It’s not immediately apparent that the table is a musical instrument. On the underside of the table top are tuned strings. You can stretch out on the table, wrap your arms under it and, as you pluck the strings, feel the sound as well as hear it. There are bells, Tibetan singing bowls which, when rubbed, can produce haunting cries, tuning forks, spoons, native-style drums and a drum-like instrument that creates sounds like those of waves washing up on a beach. Perhaps typical of the people who come to see Mikaël Zayat, are a woman and her son who arrive at the house shortly after I do. The boy is 10 and has been having trouble sleeping. They have come before and Mikaël speaks with them briefly. At one point he asks what kind of lights the boy has in his room. The energy-efficient neon lights highly touted by Hydro Quebec affect some people adversely, Mikaël tells them. There are people, and Mikaël avows he is one of them, who are better off using the older style incandescent bulbs. Sometimes even a small change or adjustment can make a great deal of difference. Mikaël shows the boy a balancing game and the mother starts perusing the library shelves. They will still be there when I leave. For his part, Mikaël Zayat extracts essences from plants because they too can be part of a healing process. Mikaël Zayat learned how to extract essences from a French aroma therapist. The process involves allowing steam to pass through foliage or branches and then condensing the steam to draw off the floral water. He points out that he has learned much as well from Native Americans, and from the descendants of early settlers who would do things like hang camphor around their necks to avoid colds. Distinguished descendant of oil-producing ancestors, Mikaël Zayat now transforms the unctuous liquid into perfume. Calming, energising, or inspiring decoctions…everything to breathe in health. He adores spruce, a conifer whose foliage, is as gentle to the touch as “a mother’s love,” its essence helps people to overcome the difficult stages in life. He readily collects it along the forest’s edge, just like St-John’s wort with its brilliant yellow flowers and antidepressant virtues. RELAXATION: Spruce, lavender and sage. Spruce is the all-purpose of essential oils—everyone should have a bottle close at hand. It is of course a sedative and a natural anti-depressant, but its antiseptic properties make of it a great ally in the treatment of burns; also, it stimulates the immune system. MUSCLE TONE: Chewing St-John’s wort https://zayataroma.com/en/+item/hv6455337 is a traditional Quebecois and European remedy. Mikaël Zayat mixes little yellow flowers with olive oil, a mix he then exposes to sunlight for several months. The resulting reddish mixture can be rubbed over the region of the kidneys to give an extra kick-start to the body before any special effort. We use it preferably in combination with fir essence. A GOOD SLEEP: Spruce, lavender, and mandarine. Soak a cloth or spray your pillowslip. Mandarine alleviates problems of insomnia, nervousness and anxiety. I recall being a young boy in times of spiritual celebration, looking at the smoke from the burning incense….smelling the pungent aroma, watching the white smoke rising from the incense burner. It was uplifting. I felt like the smoke was carrying our souls with it. Our spirits wanted to rise with the smoke soaring up the heavens. There was a sense of unity with all of those gathered around us. The products were extracted from various trees, frankincense, etc…and the memory, the feeling of goodwill and safety returns whenever we encounter these fragrances today, in incense and oils. As an adult, one day I was in the mountains of Mexico near Popocatepetl far removed from pollution. I was visiting a friend and he took me to a small shrine where I met a master, a leader named Guru Macelli who was giving a meditation course. I sat and listened to his lecture. He was a very sensitive man, taking special care with each little object. He discussed incense and its importance to people throughout the ages. Guru Macelli went on to say that now much of the incense on the market is manufactured from synthetic fragrances. Today, many people, when buying incense, are not careful to look at the origin. They just smell the box or envelope….If it smells like strawberries or vanilla, things that they like, they buy it. But these are just pieces of wood with a wood powder attached to it – dipped into synthetic fragrances….When these products burn, they do just the opposite of what we are looking for…they drag us down instead of lifting us up. Long exposure to artificial products has the potential to be harmful. These can be found in many areas in our homes…candles, incense, cleaning products, soaps and many perfumes. The base of the scent is extracted from a petroleum product. Synthetic incenses have been tested in temples in India and found to be more toxic and more pollutant than the smoke from cigarettes. They try to fool us, but when you burn these over a period of time, they might make you feel ill…they tend to make you feel low…People don't understand this. There is a truth in essential oils and aromatherapy. I believe that it is my responsibility, my duty, to educate people to the importance of pure essential oils in our lives. This is my mission. Mikael Zayat is a distiller of essential oils in Quebec . He has been doing research for over 25 years. He is the president of Foundation du Havre, a foundation dedicated to promoting a healthy, balanced life-style. In the highly developed, technical world we live in, we have come to depend on many things that are not essential. Essential oils go to the essence of things. We are here in a garden created especially for us to be shared and enjoyed. We experience everything through our senses -touch, taste, smell, seeing and hearing- and through these we truly come to know our environment. There is a type of veil produced by our senses, our intuition, that is projected outward, and it is only by following our instincts and coming to trust ourselves that we obtain true knowledge. The size and magnitude of this creation is beyond anything that we can comprehend. One cannot visit the garden all at once. You can view it all from above, but from that level youare not able to see all of the different stages of growth and the individual beauty of each flower, the subtle differences (colors, scents, shape of the leaves) that make each one unique. Some of the most fragile and delicate flowers are so tiny that you ave to be a small child to even notice them -under the shrubs and bushes. Usually we are so busy looking ahead and above, we don't notice the small gems on our path as we walk on them and crush them, unaware of the loss. According to David tewart, smell is the only sense directly connected to the central brain, rather than the frontal lobes. Because that part of the brain deals with nonverbal and emotional functions, he says, "our first response to anything we smell can be emotional rather than ational." In other words, oils can also bring about emotional healing and increase spiritual awareness in ways we can't fully understand. Alchemy is the transformation of our heaviness and darkness into light. Everyone has the potential to be an lchemist. It is through our heaviness that we come to know our lessons. We need to have this part of the balance in our lives so that we may experience the creativity of transformation. It is only with love and joy that we can do this, not by following any ormulas or chemical procedures. We must be present in a field of freedom to accomplish this. Mikael offers conferences, lectures, seminars and courses in aromatherapy and other topics related to natural heath at his home in Bromont, at the Garden of Life Academy in Granby and around the world.